Shhh, don’t tell my daughter these aren’t fried! If I can fool her, then these passed the test. She loves tostones, and got so happy when she saw me making them, I kinda felt bad because I said, she’ll know something is different, she always does! But she ate them without a peep and even said how good they were. Fried tostones, aka patacones depending on what country you are from are fried green plantains, the latin equivalent to french fries in America. Usually a treat I occasionally allow myself because they are not exactly low in fat. But now I will be eating these a lot more. They are just as good as the fried ones without all the points. The trick is to bake them until they are brown. Serve them as an appetizer with mojo, a pungent dipping sauce made with garlic, cumin, oregano and sour orange juice or a combination of orange and lime juices or guacamole for dipping or eat them as a side dish with rice and beans. Peel plantains and slice into 1/2 thick slices. Place in a bowl and toss with oil and salt. Arrange slices on the baking sheet. Lightly coat with a little more oil spray on top and bake for 10 minutes or until slightly brown on the bottom. Using a tostonera (a press), slightly mash each piece to about a quarter of an inch thick. If a tostonera is not available, insert the pieces between a folded piece of brown-paper and press down using a saucer or the bottom of a glass jar. Lightly re-spray the baking sheet and place the plantains brown side up onto the baking sheet. Lightly spray the top and bake for another 15 minutes until golden brown and crispy. Heat a small sauce pan on low flame, when hot add oil. Saute garlic on low for about 2 minutes, do not brown. Add sour orange, oregano, cumin, salt and pepper and let it come to a boil. Shut off and set aside to cool to room temperature. No way! I love tostones!!! I tried out this recipe and the tostones came out really great. Tasted good, I added some turmeric powder to the oil mixture. However, didn’t like the sauce at all…so next time will serve with a dip of my own. 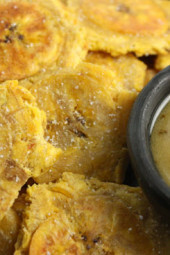 Thank you for sharing a healthy baked tostones recipe. I so wanted these to work. When I’d smash them the plaintains would just fall apart. Ahhhh! 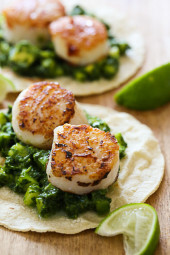 I just discovered your blog today and I'm so excited that you have all these healthier versions of latin foods. I cook for my dad a lot (he's Nicaraguan) and feel guilty about giving him so much fried stuff – this will really help! Thank you! YUM! I love tostones, we eat them with salsa and it is a wonderful combination. I was wondering if the plantains should be soaked in salt water? If I remember correctly, my FIL, a Puerto Rican, either soaks or boils them, then smashes then fries. Does that sound right to you? Maybe soaking would help with the dryness? No matter, when you scoop some salsa, it's all gravy ;0). Thanks so much Gina, you make staying on plan enjoyable. I LOVE tostones! My family is from Haiti and we call these "banane pèse". My mom always makes it for me when I'm craving my favorites. I rarely make it since it's fried but you have saved me! By the way, I made your chicken enchiladas last week. So yummy. making these tonight, and I'm not familiar with the points system. I was curious as to how many calories they are? So glad I just found these. I saw tostones in the picture with the Picadillo and thought "That sounds like such a good combination.. I wonder if Gina has a healthy version." Thank you! Made these tonight. Maybe I did something wrong but they were nothing close to the fried version, barely even edible. As a Puerto Rican lover of tostones, I will continue to fry them. I will simply eat them in moderation. Hi Gina, I LOVE your blog and my whole family is so much happier with my cooking thanks to you! I was wondering if I can freeze the tostones for a few days after smashing them and bake them the second time right before I serve them. Seriously, you are brilliant. We have Dominican Abuela living with us and her tostones are AWESOME, but the oil oozes out of them. I'm going to make these for her and see if I can fool her. Tostones are the best thing EVER! Nervous but going to give these a shot tonight. Are they supposed to be crispy like a plantain chip? Or more soft in the center??? I just made these!! Yummy!!! Gina, My Mother-in Law cooks the Plantain first in the Microwave, then sliced them and proceeds to fry them…I'll try to put them in the oven and see the results! I'm also from P.R.!!!! I am so excited to try this! I was wondering how many calories there was for the baked plantains. I am not on WW, so I don't really understand the point system. Thanks SO much! Gina I am absolutely in love with your recipes, I visit the page almost everyday! 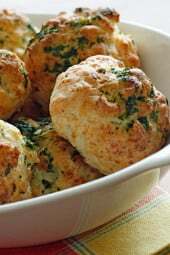 I'm eager to try this recipe and I was wondering if it would work as well with extra virgin olive oil as well? Or would the amount of oil have to be increased? What are the calories for the tostones? You are officially my cooking hero! I love platanos and thought I would have to give them up! Bravo! Made these tonight and was surprised how good they were. I think I will make them a little thicker next time and try them with the dipping sauce. Just made these. They were surprisingly good! I really didn't miss them being fried twice. So excited I found a baked tostones recipe. Thank you very much I hate frying so this is perfect. The dipping sauce I like with these is real simple…definitely for garlic lovers. I don't measure but if I had to guess use about half cup vegetable oil, mash 3-4 cloves of fresh garlic into the oil. Add some dried oregano about half- 1tsp. Add white vinegar about 1tbsp then salt&pepper to taste refrigerate for about an hour. I also put some of this over my white rice and meats as well. Again I don't measure but just tweek to your tastebuds. I was wondering what the calories of the dip were? I think it would be hard to bake a whole one flattened, but yes, you can do it with a fried one. I've often fantasized about a steak sandwich on tostones! You can certainly use these for bite sized sandwiches! If I'm not mistaken I've heard of some variation of these being used as bread for a type of Cuban sandwich (Where instead of flattening them in slices, the entire plantain was flattened lengthwise). I believe i was it on a Cooking Channel show but I didn't bother making note of it as I didn't think there would be a way to make it healthy and retain the original flavor. I'm going to have to consult the Google now. Lisa and Christina, I've attempted skinny mofongo but some things just don't lighten well. I didn't care for it. Gina, I just started doing WW and someone in our meetings recommended your page. I'm really impressed! Can't wait to make some (actually, many) of your recipes. I'm Puerto Rican, born and raised (so is my husband and kid). We just moved to Northern VA four years ago. I actually made tostones 2 weeks ago for a dinner party at our house, so I'll be making these to see how goes. Instead of garlic in our MayoKetchup, we use tabasco sauce to add a little zing. As Lisa asked, I would love a skinny mofongo recipe! Hello Gina!!! I have been making these at home for years now from your site (for my picky Cuban/ Puerto Rican Fiancee, and he loves them! : ) I'm italian and have a lot to learn about spanish food. Since I was introduced to Mofongo last year in Puerto Rico, I have been dying to find a low cal way to make it! Any suggestions? These are best when eaten fresh out of the oven. I dint recommend reheating. I'm planning to make these for a party… can they be made a day or two ahead of time and reheated in a low oven? The plantains should be very green. And they should be cut exactly into 1/2 inch thick slices to get the right size. Gina, I made these and they almost have the consistency and taste of a really dry potato. The outsides are very crispy so I know I cooked them enough, and I've had them before and know they shouldn't taste like this. What went wrong? I'm wondering if I just didn't buy good plantains! Jennifer, plantains are not 0. Just put this in recipe builder, assuming it's 3 cups, then it's 4 points per serving. I've been cooking your recipes all week. Tonight was Taco Chili. Delish! Was wondering….now that all fruits are free, would these plaintain chips be zero points if we eliminated the dip? Also, I'm thinking of sauteeing some plantains in Pam with a little cinnamon and agava syrup. What do you think? For those of you who thought they were too dry, you could always toss them with a little more olive oil. Still better than frying!!! I've made these many times since posting, don't cut them too thin, they won't work and don't overcook them or they will get dry. It takes a little trial and error with your oven, but when you get them right, they are perfect!! Linda- so happy a native Puero Rican gave these the thumbs up!! I have a delicious dipping sauce my mom makes I will share with you soon. It's garlicky and healthy at the same time!! My father is Cuban and has eaten tostones all his life. Regrettably, he did not like the recipe and complained that the tostones were too hard and did not compare with fried tostones and I agree. Some health recipes are well intentioned but never come close to the real thing – this is one of them. Sorry folks but you'll have to fry some plaintains to get the unadulterated true taste of tostones. Great recipe! Love the mojo sauce! Tried the recipe last night and I am sorry say that the Tostones came out very had and did not compare to fried tostones. Maybe you have some suggestions as to what might have gone wrong. I follow the recipe for the most part but cooked them a litter more time to brown them. That's funny! I always find them near the banana section. I would ask your grocer to see if they carry them. I think you can find them easily in most states. Bananas would not work here. Made these last night and my Cuban hubby LOVED them. They fry in so much oil in Cuba; it's nice to still be able to enjoy all the great food in a healthier way. On a side note, I also bake the ripe plantains; cut side up in a baking dish, bake for about 10 minutes, then put picadillo (already cooked) on top, sprinkle with a bit of cheese and bake for another 15-20 minutes; like a lasagna. These are terrific! We serve Venezuelan style – topped with a mixture of shredded cabbage and carrots tossed with tres salsas (ketchup, mayo, mustard and worcestershire sauce). It's like a little bundle of coleslaw on top. Really delicious! Thanks so much for this baked recipe. You're welcome! They really are easier than frying! Thanks for commenting!! OMG thanks you so much Gina!!! I am haitian and we cook fried plantains all the time. But this was so quick and easy. My niece loved it so much and my daughter was crying for more. THANK YOU FOR THIS!!! Puerto Rican food is so good, but not usually light! I love lechon! Especially the crispy skin. So fattening though!! Give these a try, they are great. So happy to find this recipe! My hubby is half Puerto Rican and his uncle (full puerto rican) cooks the BEST things including these! I took detailed notes last time we visited on how to cook the fried ones (along with puerto rican rice and lechon) but this is a great healthier alternative! I grew up eating them too. Moms Colombian but I have family in many countries, including Dominican Republic. Love it!! I love Tostones a lot! If you are from el Caribe like me (Dominican), you grow up eating them almost everyday! Thanks so much! I will give them a try! Oh my! My family loves tostones and I searched the internet for how to bake them. We learned to bake empanadas and they are awesome. Thank you for saving the platanos in our kitchen. Can't wait to try this tonight! i made some today and it was better then the fried! definately a good idea!…yummm! These were great, had them with guacamole and you can't even tell the difference. Loved them! I am looking forward to trying the oven baked patacones, versus the fried ones. My question is, are the points for one patacon? What is the serving size? Thanks! @ Eli, yes! These are fab, especially with mojitos!!! I'm in love! Skinny jeans, here I come. Trust me Odalis, from a Colombian househould… and hubby is half Puerto Rican… They are awesome! I MUST SAY I LOVE YOUR BLOG AND EVEN MORE SO THAT I SEE YOU ARE COLOMBIAN AS WELL..I AM COLOMBIAN AND MY HUSBAND IS MEXICAN AND WE CANT WAIT TO TRY ALL THE GREAT RECIPES!!! Yes, you can use yellow ones, or even better, when they turn almost black (super sweet). 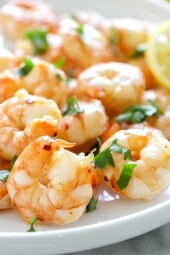 The healthiest way to make them is to bbq them or bake them in the oven. You cut the ends off, and cut them in half. Put them on the grill on a low flame turning constantly and they cook in about 20 minutes. No oil added. You can always add a little brown sugar and cinnamon if you wish at the end. Actually, you can make fried plantains with yellow plantains; they are great as a dessert item with cinnamon sugar (or maybe cinnamon and Splenda?) on them. I’m going to try baking them and see what happens. Thanks for posting this, Gina! 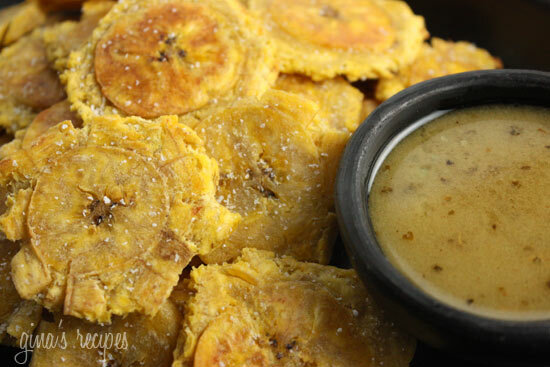 I love tostones, but have never tried baking them! They look as good as the fried ones, and the sauce sounds amazing! Ripe plantains are sweet and aren’t used for tostones. I’m not sure how they would come out since they are usually a lot softer. I will post recipes for ripe plantains this week. I am new to your site and have to say it’s great! I will definitely be frequenting your blog, often! What would happen if you used ripe plantains with this recipe. WOuld it work. I have 3 sitting on my counter. Yes it does. And they get a nice caramelized color, too! Just spray plaintain with pam spray and pop in the oven. @aleta meadowlark I love yours too! We have similar food tastes I see! Seriously, I have to tell ya, I love your blog. There are few that have recipes every week that I want to make. Thanks so much for doing what you do! What a fun snacky idea! WOW…love your blog. So glad I found it. I’m a follower now! Oh Gina this looks so good, thank you for sharing this. Oh and I sure won’t tell your daughter, lol! Have a great day. Yum! I love that these are not fried!